This experiment guide covers the latest standards for College Board Advanced Placement Physics 2. How-to videos are included with the manual., on the PASCO web site and on YouTube, and can even be installed on your own computers. These videos focus on setting up the labs and getting the most from your PASCO sensors and equipment. 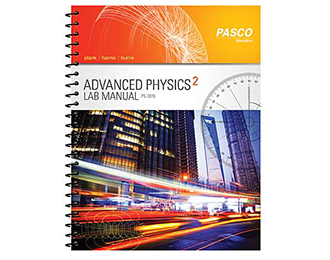 There are 16 investigations in the Advanced Physics 2 Experiment Guide. 8 can be performed using the PS-3816 Equipment Kit. The remainder can be performed by adding the PS-3817 Expansion Kit.